When it comes to using blush I usually go for powder formulas. But lately I’ve been watching so many beauty youtubers raving all excited about Tarte’s cheek stain that I had to try it! And this is where my love affair started with these stains; I collected almost the full range…. (oops) From sheer warm pinky shades to more peachy-pink colors. I have been using the two shades called fearless and flush the most, they are very wearable and give the most natural finish that compliments my skin tone well. They all look so pigmented in the tube, that it scared me! But on my cheeks, they didn’t turn out overwhelming at all. They are seriously foolproof and when you find the product is starting to run out, you can easily push the product out from the bottom. I apply the stain over my foundation and my bronzer, tapping the easy-to-use slim applicator directly on my cheekbones and blending it in with the bottom of my Beautyblender sponge. The cheek stains blend into a subtle, illuminated flush and I love how they create such a bright and a healthy glow. By using this technique, the coverage is easy to intensify without looking like a clown. The texture feels a little sticky at first and your hair might get stuck to your face, but after it dries (which is quite quickly), it’s like it’s not even there. Like in all Tarte’s products there are no parabens, synthetic fragrances, phthalates or sulfates to worry about and the formula is alcohol- and oil free. 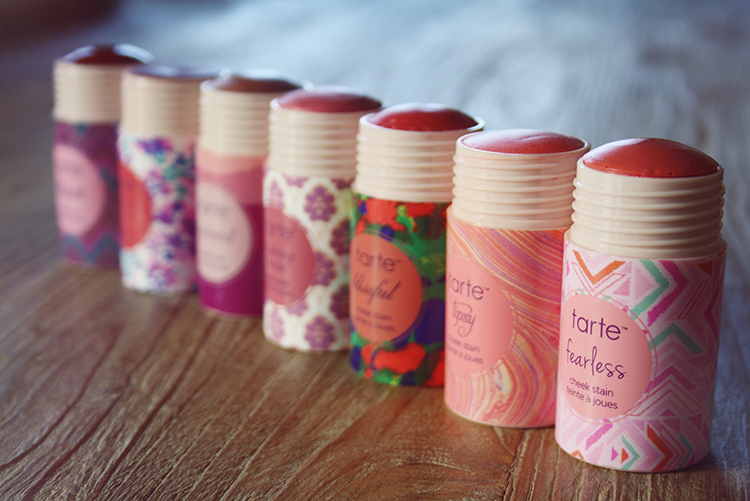 These slightly fruity scented, sheer blushes lasts forever on my skin. They’re $30 each, but they last such a long time, so they still seem like a great deal to me. Have you ever tried creamy blushes? Posted in BeautyTagged and a thousand words, blushed, Cheek stain, make up, Tarte cosmeticsBookmark the permalink.